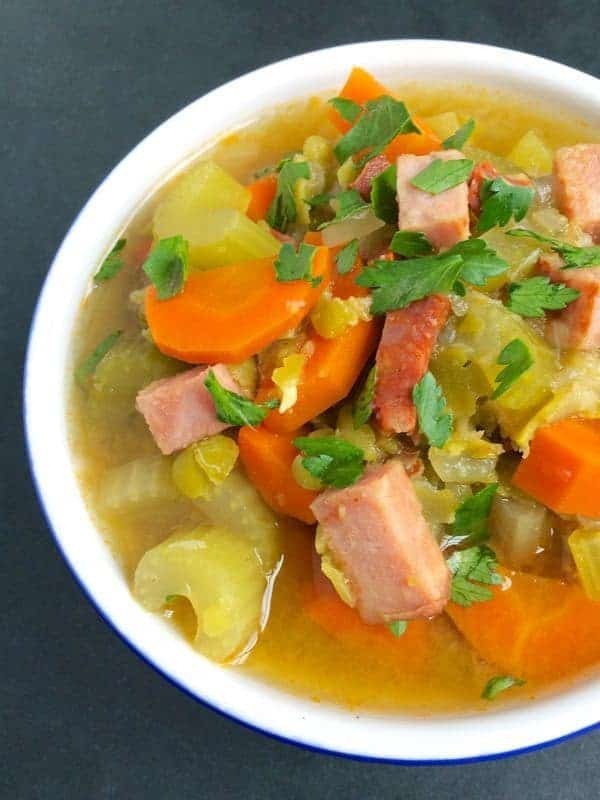 Slow Cooker Split Pea and Bacon Soup is everything you expect from this classic dish made easy with the help of the crockpot. Requires 15 minutes of prep and packs 11g of protein. With a new year right around the corner, just about everyone I know is ready to shift their focus away from cookies and re-prioritize healthy eating. We all know what we should be eating – whole grains, lean proteins, leafy greens… you know the drill. So what’s stopping us? Turns out: TIME! In fact, I recently polled my Facebook fans asking, “What is your biggest challenge when it comes to healthy cooking?” Two answers came back loud and clear: lack of time and a lack of easy (and delicious!) slow cooker recipes. Ask and you shall receive, my friends. Slow Cooker Split Pea Soup with Bacon comes together in a matter of minutes and pretty much cooks itself. Want to save even more time? Make a double batch and save for busy weekday lunches or pop in the freezer for another day. 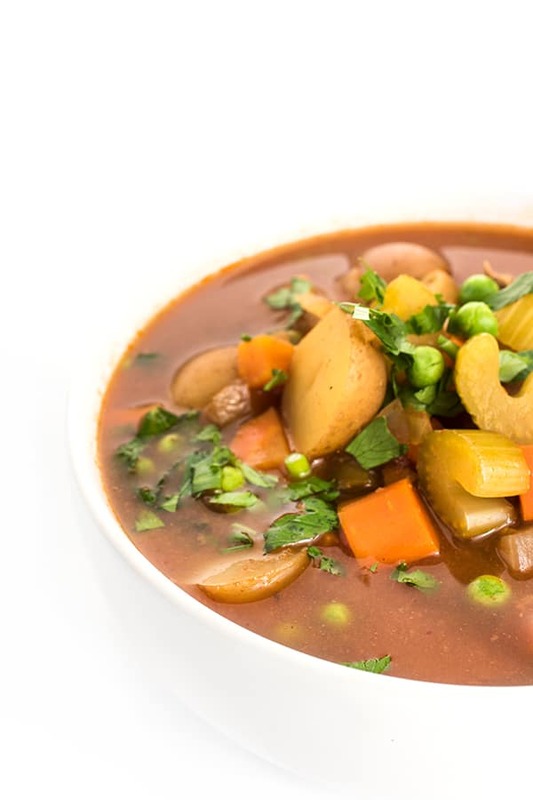 By taking a few minutes in the beginning of your day to throw this soup in the slow cooker, you will be rewarded with a hearty, satisfying soup packed with the protein, fiber and nutrients your body craves. No red and green sprinkles required. Cook the bacon strips in a medium pan over medium-high heat until crispy and browned; set aside on a paper towel lined plate. In a slow cooker, add all remaining ingredients including the cooked bacon. Heat on Low for 8 hours or High for 4 hours. Season with salt and pepper to taste and garnish with fresh parsley before serving. Since different brands of chicken broth and bacon have varying amounts of sodium, season this soup with additional salt and pepper according to personal preference. I have always cooked my split pea soup on the stove but wanted to try using a slow cooker. I used two pounds split peas along with 2 cartons of chicken stock and 2 cups water, (total 8 cups) plus seasonings, ham and vegetables for 9 hours. Flavor is very good but very watery. I also purred the soup. I’m hoping it will thicken. Can I continue to leave it on low? How long would it be safe to do so? I hate thinking I have to transfer it to a pot because I won’t be serving it for another 6 hours. Any suggestions Thank you. I would keep it on warm if I were you! I’ve tries this recipe multiple times and I am very pleased with the results. It’s cheap, and easy, and tastes great. I have added more of the veggies to make it more hearty. It is a watery soup, not what I expected at first, but it turned out just right. Now I am trying a different approach. I added some potatoes and mushrooms, to empty my fridge from stuff that was going to go bad, and did stew beef chunks instead of bacon. I also added some roasted hatch chilies to make up for the cold weather. This is a recipe I will use quite often, but this time, I’m trying to expand and experiment with this recipe. 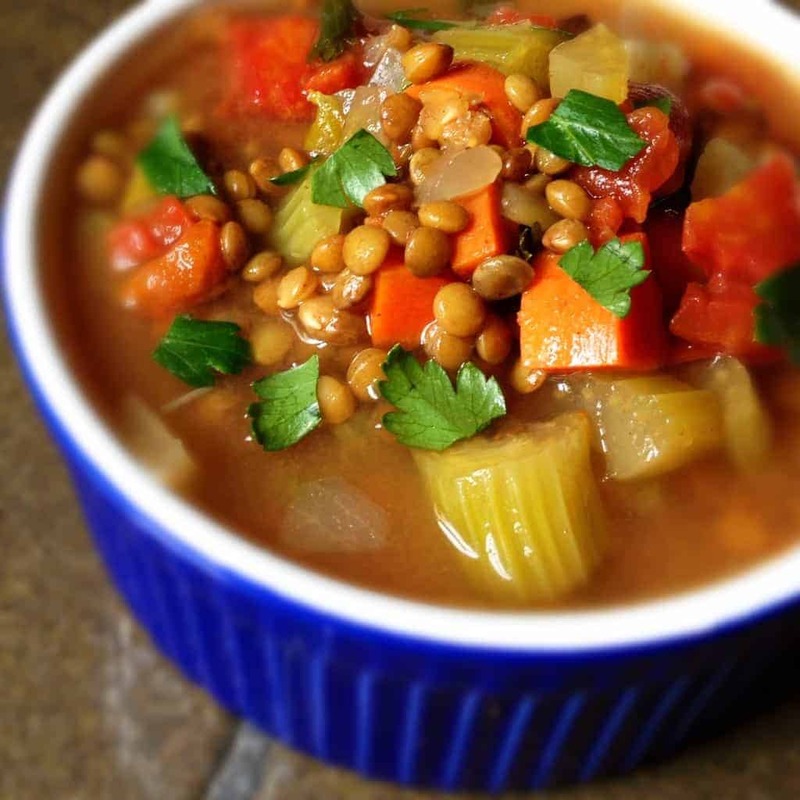 I love lentil soup and this recipe reminded me quite a bit of it. I’ll let you ‘now how the experiment turned out. I’m so glad you enjoyed it! Love that you’re making it your own – that’s what cooking is all about!! Just as an update, the experimental recipe turned out amazing. The beef was so very tender. I’ve tried many different pea soup recipes and all call for a full 1 lb. bag of split peas (about 2 cups). So that’s what I did. It’s in the crock pot now, so I can’t speak to how it came out but just noticed many others said their soup came out watery. I think that’s definitely because of only calling for 1 cup of split peas. Using a full bag should fix the problem. The soup had a great flavor! I didn’t think it was too watery, but I did use the whole bag of split peas. I also used about 4 strips of bacon and just a pinch of thyme. Otherwise, followed the recipe exactly and it came out great. Thanks! I’m so glad you enjoyed it! Yes it’s definitely a bit thinner but you can always add cornstarch to thicken. Glad you enjoyed! I’m so glad you all enjoyed it!!! 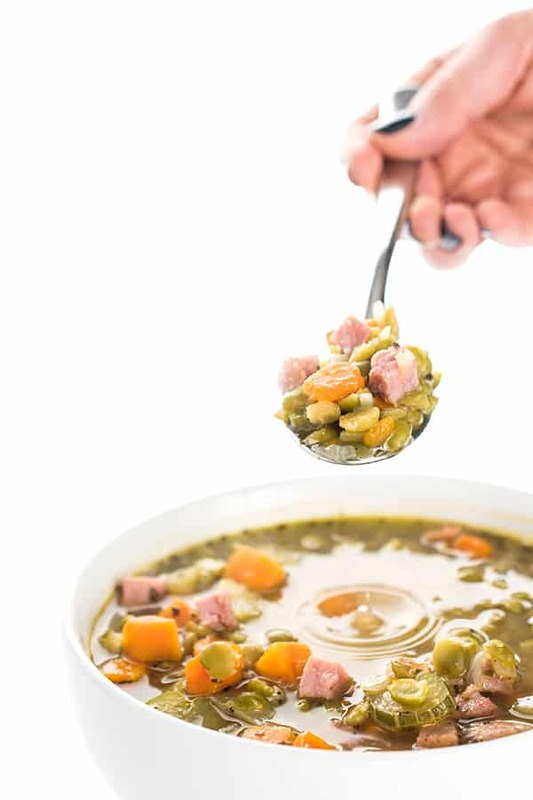 I am embarrassed to say that I have only eaten split pea soup from a can because for some reason I thought it was more complicated then this and I am the only one I know that eats it. So wish me luck I’m fixing to start my first ever pot of home made split pea soup…. Trust me my husband is addicted to canned soup! I get it! I also had the problem with it being very watery, I’ve had it in the crock pot for 10 hours now. The recipe has all of my favorite ingredients, I think I’ll just use the broth without the water next time. Oh shoot – I’m so sorry it was too watery for your taste Marilyn!! I hope you still enjoyed it! I’ve heard that variations in final liquid levels can be due to differences in the slow cooker. People who have very tight lids that do not let out a lot of steam may have a more liquid final product. My slow cooker is missing a few bolts in the lid and it lets out enough steam that I have to be careful when cooking something with minimum liquid that it doesn’t dry out! That’s a great point Julia thank you! Just about to make this in my slow cooker, I’ll let you know what it turns out like …. Bacon gives this a hit of flavour. For those that can’t have bacon I’d use one or more of ham flavoured seasoning (vegetarian), smoked paprika or liquid smoke. I will be giving this one a try. Oh no I’m sorry yours was watery Wendy!! I’m glad you enjoyed the flavor regardless. I found this recipe and was so excited to try it. I love Split Pea Soup! I currently have this in my crock-pot with only one more hour of cooking time to go. It smells wonderful in my house; however, I am getting a little worried. The soup looks VERY watery! I followed the recipe to the T, and it looks watery. I even gave it a little stir, thinking the peas maybe just needed to move around a bit.. but still watery! Is this how your recipe is supposed to be?? I am used to split pea soup being on the thicker side. I’ve actually never seen watery split pea soup. I just hope it tastes good..
Hi Jennifer – How did it turn out?? Mine got really thick over time and if it’s not thick enough, just continue to cook it down and more of the liquid will evaporate. I hope you enjoy it as much as we did!! The flavor is really good, but it did stay very watery. I even let it cook a little longer, and turned it up to high. =( Not sure what happened because I followed the directions exactly as they were listed. The important thing is that it tastes good! Oh no!! I’m so sorry. I will say, it’s not supposed to be thick like it is out of a can. It’s definitely a bit more brothy. But still I’m sorry it wasn’t what you were looking for. I’ll make a note to the recipe to reduce the liquid if you want a thicker soup. Thank you for your helpful feedback! Hi my father always used to shred a potato into his pea soup and it was thick and delicious. He also used to use half green and half yellow peas…. this gave it a really great colour! Making this today, burned the bacon, will search for paprika if needed. Thanks Liz! Yum!!! Let me know how it turns out!!! Enjoy sista! So, I had this in my slow cooker (double batch) for 4 hours on high. Everything came together beautifully, used veggie broth, pearl onions, thyme made it super tasty. Only problem? HARD PEAS. Left it on overnight on low (adding another 12ish hours). HARD PEAS. Brought to work today, heated up. HARD PEAS. I used a potato masher, but those darn peas are not budging! Any ideas? Put on the stove? Use immersion blender? Umm….That’s bizarre. I normally don’t even soak mine. Is it a brand you’ve used before? Was there enough liquid? I can’t imagine how on earth they wouldn’t soften after 4 hours on high let alone 12 hours overnight!! So sorry – the only thing I can say is perhaps they were really old peas? So sorry. I love the idea of slow cooker split pea – I don’t do pork but I am going to print this and make with turkey bacon! Adding this to my list to try! I have the lentil with bacon soup in queue, too! Cheers, friend…here’s to a wonderful 2013! This looks insanely delicious. And healthy too! And hearty. I could add many “ands” to this one. Thanks so much Joanne – I love letting the slow cooker do all the work!! Happy New Year friend! Awesome….was thinking that New Years Day would be a good day for a healthy, hearty soup. One that involved bacon just pushes it over the top. Thanks for sharing. Thank you so much – the bacon makes the soup!! Perfect smokey, salty balance to the green peas. Enjoy and Happy New Year! Any recommendations for a substitute for the bacon if we can’t eat bacon? Assuming you can’t eat Canadian bacon or ham, I would just skip it and add more salt. Another idea for smokiness without pork would be to add smoked paprika. Hope that helps!! One more thing – turkey bacon would be great! Try Turkey bacon if you can have that. If you are unable to use this skip it but add some cumin to add smokiness flavor to the soup.